If you enjoyed The Kid’s Guide to Service Projects, click here to check out Real Kids Real Stories Real Change to read real life stories of children doing incredible things to better the lives of people all around the world! Resource: Click here to access Youth Service America (a program committed to helping children find their voice and take action) to find ideas for service projects by category. The Kid’s Guide to Service Projects is a complete guide that students can utilize to make a difference in their communities. Organized in an approachable manner, Barbara Lewis provides students with real-life stories of children making an impact, both big and small, in their communities and around the world. 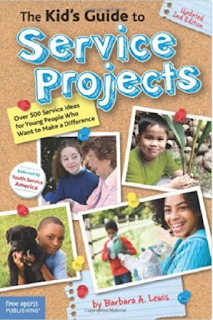 The book breaks down service projects into commonly advocated for topics: animals, politics, community development, homelessness, the environment, friendship, health and wellness, etc. 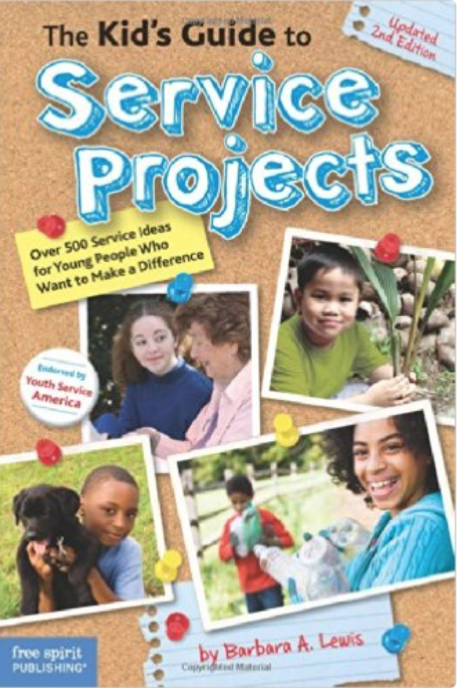 The next section of the book delves into the “how to’s” of service projects. In these chapters, the author gives students step-by-step guides in creating components that may go into their service project (such as posters, proposals, lobbying, etc.). The most important thing this book does is empower students to take on service projects no matter how big or small, and allows them to realize that anyone can make a difference. The Kid’s Guide to Service Projects provides a perfect “blueprint” of what it means to take social action. Filled with inspiration, tips, and resources, The Kid’s Guide to Service Projects empowers students to take on social action, gives them a clear guide of how to successfully take on social action, and inspires them to never give up. This book could be particularly impactful to students because the plethora of topics allows every student to find an area that is relatable to their lives. Whether they are seeing crime first-hand in their communities, are being bullied or know someone being bullied, or simply love animals and want to make the world a better place for them and the people who live here, this book gives students a wide array of topics or inspiration to choose from. Further, giving students the how-to guides, complete with step-by-step instructions of how to plan and implement various aspects of service projects, only sets them up for more success. The Kid’s Guide to Service Projects is filled with so many ideas and inspiration that it could be used in virtually any Social Studies lesson (it could also be used across content areas to simultaneously address a social studies standard). An example of how it could be used in the classroom is to have the students read an informational text on waste, and perhaps develop a passion for curbing waste in their communities. Students could access this text to follow step-by-step instructions on how to put a recycling program in place in their school or home communities. By utilizing the guided how-to’s throughout the book, students could learn how to create effective flyers, PSA’s, and even attempt to enact an ordinance or law.